Tired of wearing so much bug spray and smelling the citronella candles? Do you have a cabin or a lake home you can’t enjoy because of pests? Having an outdoor party or wedding that you want to be pest-free? Are you frustrated with having to go back inside your home because you are getting bit up in your own backyard? If you’ve answered “yes” to any of these questions, then you need to contact Premium Lawn Service. While we take care of your landscaping and lawn care needs, Premium Lawn Service is also here to help you get rid of mosquitos and ticks that prevent you from enjoying the outdoors. If you’re searching for that magic, mosquito repellant solution, your search is over. 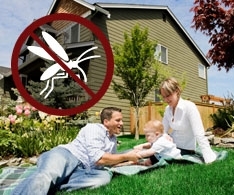 Premium Lawn Service offers quality mosquito spray services in Eau Claire, surrounding areas and northern lakesides. You’ll experience your backyard or cabin like you never have before! What’s great about our product is that it kills mosquitos or ticks on impact. The spray also bonds to the trees or plants, which acts as an “invisible fence” to mosquitos. This prevents them from entering your yard, which lasts for a few weeks. The process is quick, easy, and painless. The spray dries pretty quickly, meaning your children and pets can be out playing in the yard soon after we’re gone! Why you should use mosquito and tick spray? Premium Lawn Service has a product blend that greatly reduces both of these pests and others like fleas and gnats. The product should last several weeks depending on amount of rain in the weeks afterward. We offer packages of 5 or more applications, or a one time event spraying. If you’re ready to enhance your outdoor experience this spring and summer, then contact us today for a free estimate!